Here are the answers to some questions you might have about the author and the series. If your question is not answered here, use the contact form on this page to ask directly. 1. Who is Flora May? Flora May is the author of The Fairies of Farholt and of over 100 other books for children. 2. Why haven't I heard of her? Is Flora May her real name? You might have heard of her under one of her other author names. Flora May is not her real name but it is an important name to her. Her grandmother's name was Elsie Florence May Bonney. Elsie was a tiny person who loved flowers, animals and children. She collected mushrooms, walnuts and blackberries and grew gooseberries, green peas and plums and wonderful irregular beds of pansies, honesty and polyanthus. In her garden was an apple tree that was over a century old, and there was a ghost in the upstairs room. As if that wasn't enough, she had a rose named The Fairy in a special bed marked out in river stones. 3. How many books are in the series? The first title, Clovie Trefoil, will be published in 2012. The second, Billabunya, should be out in the first half of 2013. Currently, six books are planned, but who knows? 4. Will the stories stand alone? Yes, but each will be part of an overall story arc. 5. One of the places in the first book is The Islands of Sky. Don't you mean The Isle of Skye? No. The Lands are not in our world. However, certain similarities have leaked between the worlds. 6. Some of the fairies in the first book talk like Scots. Are they Scottish? See the answer to Q.5. They're not exactly Scots, but yes, they sound like them. 7. Some characters, such as Moll o' the Marsh and the Heatherghillie, speak with a broader accent than the others. Why is that? Moll and the Heatherghillie are very long-lived, even for fae. Their dialect reflects their age. Clovie, who is a child, sounds more modern because she is. 8. Why are the characters mostly called fae? Why not fairies or faeries? Fae and fairy mean more or less the same thing, but to some readers, fairies sound like cute little girls with wings and wands. The fae is this series are certainly fairies but they are not cute. The word faerie is an adjective. Besides, fae is both singular and plural (like fish, deer and sheep) which makes it a handy word to use. 9. What readership is intended with this series? 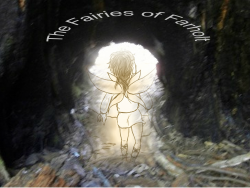 The Fairies of Farholt is intended for readers in primary school. It can be read aloud to younger children and older readers may also enjoy it. 10. How scary is the series? Since the stories are styled as quests, there is some suspense and danger. There is no graphic violence. The characters might be afraid, but they never give up. 11. The Florafae have a bad opinion of the Faunafae and Aquafae. Isn't this a poor role model? The various orders of the fae all have odd opinions about one another. One of the major themes of the series is the need to form one's own opinion from experience rather than blindly accepting opinions of others. The viewpoint characters can and do learn to see things differently. 12. Who are the baddies in the series? There are good and bad characters from all orders of fae. In general the Fashfae are the worst behaved. As their name implies, they fash or annoy others. At the beginning of the series Clovie thinks the Fashfae are like wasps that have somehow learned to talk, but as the series progresses more balanced opinions will surface. A Fashfae is the protagonist of a late book in the series. 13. Are there lots of difficult words in the series? There will be unfamiliar words. To make reading easier a pronunciation guide and glossary is available on this site. 14. What are the themes of this series? There are several themes. Characters learn they must be proactive and think for themselves. There is also a theme of lost history and of how facts can become blurred over the years. Characters can sometimes be morally ambiguous. For example, the Heatherghillie is a dry and rather dour person, but he is a true friend. The Lochladdie is handsome and merry, but he has no empathy and cannot be trusted.